and the possibility to rent other 6 rooms at the neighbors house (against surcharge) so the total amount of beds are around 50 for a very cheap price. Dinner at the Inn next to us which is only 10 meters away so that you do not have to drive home after a lovely dinner for cheap prices. Possibility to arrange free bar at Steens Corner (Our lounge) after the dinner for the whole group. A big garage where you can store you motorcycle. Possibility for guided trips in Northern Germany or after your demands (against surcharge). that you do not have to bring or carry it yourself. A huge amount of information material in the lobby over the area. A very big lounge (Steens Corner) with Chesterfield furniture for cozy good fellowship after the dinner. 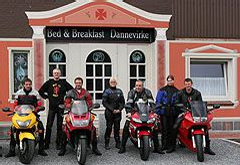 For more information please visit the MC-site of Bed and Breakfast Dannevirke. It is recommended to book the place long time in advance to be sure to obtain the wanted period.